Executive Presidency is not suited for Sri Lanka. An honest politician winning this office is very low and the chances of having a crook or imbecile is very high and giving so much of power to that person without proper check and balances is detrimental to the country. To make matters worse the justice system is corrupt or incompetent to the core. Sri Lanka will be better served with a parliamentary system like before even with all the flaws. I think until Rajapakshes are out of lanken politics, we need coalition govt to rule this country. Executive P should not be abolished and the manner as they rule now can be the best. Recent protests for no proper valid reasons, prove the world, govt is capable of handling such protests marchs without harming people. But the problem was march organisers treated those participants with all the last levels, not providing them toilets. That was the reason, colombo gabage collectors reported – they left their droppings on the road. Rajakashe instead they droped theirs in Shangrilla, Hilton and Galdari. Lanken kind of slaves should not join any kind of Rajapakshes marches, considerin ghow they thave been treated in them. If one party would be blessed with more mandate will create 89 stlye insurgencies. JVP and other violent parties would not stay away not animating people in to riots of 89 nature. Right at the moment, with rise of the gaps between the wealthy and the poor not leaving also an affordable middle class in this country, people seem to have lots problems in facing the life. That article comes from the sole member of the Bandaranaike-Ratwatte clan who is able to think in terms of the good of the entire country – having paradoxically settled elsewhere. i will try to put some of my other thoughts there, before the deadline forces us to post comments below some other article. where had you been all these days ? I missed your posts. I really did. Not many of your nature are on CT forum. I love netural thought bearers of your nature. please take good care of you. I have been commenting a good deal, but it may be that we were looking at different articles. We can’t digest every article to comment, unless we make comments like Jim Softy, who now seems to be also commenting as JD. On the other hand both Native Veddah and Amarasiri are amazing. They seem to be everywhere, and saying very apt things. Bunjappu, many thanks for saying all that about me. I try to say the things that I feel must be said, and I’m glad that you think that some of it makes sense. By the way, I’m not anonymous. Ever so often I give my name, and even my e-mail address. Thank you and I really appreciate your thoughts_ Sinhala_Man. I am so fed up reading lanken news these days. Do you believe that those alleged UNP Ministers to have added some poisonous materials to the MILK packets as being accused -I have been waiting MRI to issue their analysis which accofding to minister of Health is now being tested by them. As one comes from bio background, I know it myself that milk products become easily spoilt with hot temps. I am very careful drinking milk. That man Dalas ALaha peruma and Wimal Weerwanse to point the finger at those UNP MPs is seen to be creating new forms of racial issues. not a good idea to open your Email to the manny. Please take care of yourself. Srilanka is no safe as is the case for us in Europe. Its a very good question but does not have a straight answer for one reason its not tried and tested. Lets change the question and ask whether the current system is suited for Sri Lanka as this has been tested under four Presidents. The past presidents at one time or other have managed the country as dictatorships with the parliament or the judiciary standing helpless. Sri Lankan political culture is party before country. When the President and Govt are from two parties the chances are that there will be more stalemates than getting anything done. The govt is supposed to run the country but like its happening currently the President sabotages. It was a dirty political coup. It was solely anti Rajapaksa , not one bit pro Sri Lankan. It was disgustingly hateful propaganda based on vicious lies and exaggeration. Schokingly anti Chinese. Impetus of which led to suspension of Chinese projects for two years and vilification of poor soldiers who fought the war. Funded by foreign money. Nòt worthy of Sobhitha Thero. I will never vote for UNP for four reasons: 82’Jaffna library, 83’Black July, 89’Bheeshanaya and Prabakaran -Wicramasinge agreement. I will always vote for Rajapaksa as long as I remember the 30 year terror. I have said this before on this column. I won’t be surprised if Ranil proposes Sirisena AGAIN for another term on some crafty arrangement of Sirisena remainig near ceremonial President and Ranil an all powerful Prime Minister. Anton Balasingham called him the Twentieth Century Fox. The MS led SLFP committed suicide by aligning with RW. It no longer is the alternative to the UNP but a partner of the UNP and more harmfully with Ranil. So the people who are fed up with RW will also turn against the SLFP. You say Ranil is shrewd and has some leadership ! Is that why in 2010 he wanted to make Sarath Fonseka the President of this country ? Compared with the leadership opportunities this man has enjoyed, can you show anything he has achieved in 50 years of politics ? In these 50 years how may foreign trips has this former lawyer made ? It is said more than 2000, that is an average of 40 trips each year ! Will a man with even very small brain continue to control a national institution like the UNP with a small group of old Royalists ( who are also without exception corrupt and also very average) and run the country with old Royalists who were his classmates ? This man is an adventurer who has got hold of a political party and a country to play with and get some kick ! He amounts to nothing. It is the old frozen heads of the UNP working committee which must change, their values, their ideas must be discarded. They must not think in terms of English speaking old boys from certain families as good. Ranil has proved that these so called elite are also bogus and corrupt as everybody else.The world has changed, but not the working committee of the UNP. They are not fit to be in such a committee . 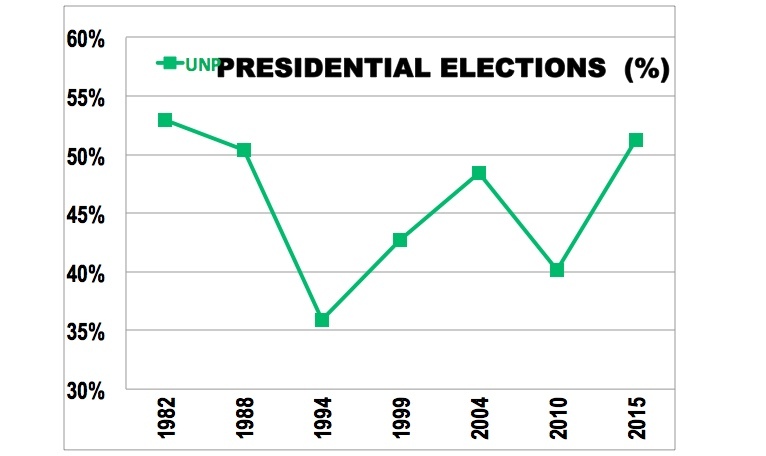 Ever since RW became leader, the UNP has been in decline. A good example of RW’s so called stupid strategies that eventually kill the UNP is how he saved Sarath Silva from a no-confidence move. He was in a hurry to go overseas and advised Maropane to drop the motion. Vishwashatru, This straw is rotten and broken, clutch at another straw! Vishvamitra, write off your ‘Civil Organizations’ this time around. They have lost their credibility -totally. They should have protested against appointing defeated crooks as MPs and exceeding the 19th amendment limit on the number of Ministers at the very outset of Yahapalana administration at least to appear relevant. They went along with bond scam and postponement of elections. They just proved that they are nothing but another bunch of mediocre subservient sycophants. If they have no influence on politicians why should people listen to them? The unity government as at now will be the first and last in Sri Lanka. The Executive Presidency created by the biggest racist and crook of all has its days numbered. What choice do the people have – UNP or SLFP or SLPP ? Assuming the Executive Presidency will exist at least one more time the people should vote for the Person and not the Party. Can there be a new Leader, writing off candidates from the three parties? Time will tell. Please no more Unity Govt. It will be a disaster and everything will be destroyed like economy, national harmony. MS is clinging on to Ranaviru tag should be not prosecuted. 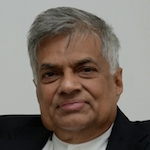 “only by being triumphant at elections can [ Ranil Wickremasinghe ] be established as a successful politician.. However, the point is that there are things far more important for us 22 million people in Sri Lanka, than shoring up Ranil’s ego. We don’t want the return of the Rajapaksas which may take place by default. So, I agree with the rest of your analysis, except that I don’t really think that “Civil Organisations” have really let anybody down. I’m sure that they may be more trusted than Ranil by the “Tamil Community”. That, obviously , is only guesswork by a Sinhalese like me. But bottom line is the need for change of leadership by the UNP. I usually do not waste my time on “vishwamithra” crap. He/she is just another individual, who barking at MR for everything and never says anything new. Do not worry Vishwa and his cohorts, the same team will be re united again if and when Ranil decides to go for polls. JVP has recently said they have “changed” their tactics when it comes to criticizing the current administration. Which is obviously helping to UNP. The so called 20th amendment is a good banner to rally round under. Think about it you spin docs of Sirisena-Wickremesinghe administration. you guys would never be away from highly abusive MR led groups. So how would you explain it to your family circles (youth) ? Are they also so stupid as you are ? Tell me one single reason as to why Rajapkshes did though some development projects but without any feasiblity studies done ? Why they abused that collosal sums from states during their days ? Today the entire folks have been made permaent debtors. Current govt would not share this – since like or not they have to pay them back. And tell us why the bugger et al is over flown with hundreds of court cases by date ? MS -RW adminsitration have achieved a lot within last 4 years. 4. People have been caught by RAJAPAKSHE extremists agendas, but current men would not stand on their way. – DEMOCRACY is overflowing across the country today. 5 By December, there will be lot more taken to custody, not excluding Rajapkshe killers that killed Thadjudeen. 6. So why cant be HAPPY ? No point of talking about the guys. We recently got to see, Maxes and their manner how they behave in that gathering. Maxes would never senses, in contrary, they would always support those goons. Now Rajakashe is linked ot Indians to topple the current govt. How come the bugger goes that far ? THey just left their droppoings near to the premises of Lakhouse, not being able to behave normal. Maxes, now you have to deal with their droppings too. There is a valid reason for blaming Rajapakse for everything. The defeat of the LTTE brought with the help of many national and international partners gave us an opportunity turn this nation into peaceful, united country by resolving the issues peacefully and amicably with the help of those who contributed to end the struggle. But the greediness, selfish, power hungry Rajapkse destroyed that hopes and took a hitler style dictatorship ignoring all those contributed and made enemies and completely wipe out the economic future. Just look back the period between 2009 and 2015 and you will never ever want to go to that period. Good decision if you want to remain a stupid ignorant bigot. With 4.87% of votes under their belt the JVP could spring miracles. JVP has been changing its tactics ever since it was established in the 1960s. Where is you mate the saffron clad thug Gnanasara, is he inside or outside? Is he married and a family man? What is now being played in Lanka is already in play in international arena. Countries with two party systems are going through the same fate as in Lanka. In the US the The GOP has been hijacked by pervert Trump and the same with SLFP. But people need to remember when the pact between RW and MS was made , at least RW tried to keep his side of bargain where as MS from day one has nothing but put hurdle after hurdle in seeing that they dont succeed. Apparently he helped the Admiral to leave the country before the court order and has ordered officials to not to cooperate with missing persons inquiry. When you have such person on the top what do you expect from the rest. Ranil: One can only admire the patience and the tolerance of Ranil. Though Sirisena has done some good things, he seems to be cuckoo on others. The other day he was admonishing some government servants why they sign the illegal approvals coming from politician like import permits for Cashew. Being a former government servant he should know that under MR they would have been sacked or even white vanned if they disobeyed the “Kings’ or other’s orders. I never thought until few weeks ago, that Africa s economy is booming today than anywhere else. So my curiousity grew so that I happened to collect some data. All of sudden, Far poor african countries have made national policies for their own and decided to work with Chinese companies in developing their countries. Today Ehtiopia – once upon a time world s poorest nation – has been the target of most of investors from Europe and China. I have seen good video about Ethiopia and how thehy handle with so many areas. No doubt, the times ahead of us will show how ETHIOPIANs make it .. overtaking South africa and Nigeria. This is really a wonder to me. what do you think Edwin Mahathathayo. Our people seem struggling to come to a consensus in terms of national policies. Just imagine, Mr Medamulana is currently touring to negibouring india as he was reborn last week. Not just few weeks ago, the very same man accused the current govt of having closer ties iwth india and no need to offer Mattala Airport to them bla bla ma.. now all seems to be hunky dory with him, just because that controversial figure Kumaraswami makes him up. Rajapakshes are betrayers of high grade. They have nothing more to prove to the lanken. Sam, what would have been Booruwansa’s, High Purity Holmanpila and several other joker’s response if this was done by Ranil? OK, forget about those monkeys and consider what MR’s response would have been. They would have bashed up Ranil and dragged his name in mud and even gone sobbing to the Chinese complaining about a love affair between Ranil and the Chinese. MR’s only concern seems to be to get a Rajapaksa in to power so that he can keep his booty hidden. I think RANIL is very strong personality than we ever thoguht sofar. He just ignores MR – inconsistencies. He does not take time to even any attacks being made on him by Sirasa, Derana or other senders today. His talks are not that too levels being added by MR these days. Did you also notice – keeping Dalas Alahaperuma behind him, MR has audacity to accuse the UNP MP of being that unhearted to poison the Milk packets ? Where Mr Medamulana is telling that Alahaperuma too is still suffering from his belly problems…… caught in the act – and silliest by every means… how can a former leader to fall that low level ? I dont support anyone pollitially, but just to hang on the kind of accusations on MUSLIM MPs or Ministers should not be made without thinking twice. There alone, we make our race that disgraceful. I wonder what MRI analysis would bring on the POISONOUS milk packets. Media should be unbiased if they really love the nation. They have become part of former goons. This is very sad to see Edwin. Sam, I saw that episode where MR said Alahapperuma was still suffering from the stomach problems. I don’t remember the exact words. There are several explanations, 2 are given below. 1-	Alahapperuma was wearing an adult pamper or several. These are thick enough to hold urine and any solid waste. 2-	He has developed the art of shitting while standing. These guys have been doing nothing but shitting half their lives and it is nothing for them to do that and let the stuff in liquid form drip down unnoticed by others. The latter part of his name – Peruma- may be derived from the fact that he is a master at the game of Pera Pera siteema (Peruma) or dripping. But please focus how liars they should be. Just keeping a man behind him, MR was uttering lies that publicly. Either MR was not informed well how he should address those issues. I wonder what the man felt seeing that Peruma is standing behind him. Either the man is fooled by their men or MR is falledn to that desperate levels. Audience is fooled, nobody takes it as serioius. In Germany too, there had been incidents going back to WW2 they had even set poisons into drinking water. I really need to see the report of investigations and see those liars be charged with maximum punishment. Milk product as you know become spolilt easily with temp rises. That is common in Europe in hot summers. Want really to see, if anything is injected into packets as allegedly added by BUURWANSE that publicly. In EUrope or any other places where peoples rights are safeguarded, such accusations not knowing it really are subjected to even jail sessions. I want to see, Buruwasnse be charged by the courts if not today in the days to come. so that we can see inner harmony in our minds. Alahaperuma is absolutely a low level politcian whose knowledge is no better to that of Namal Baby. Just tell me please how many of them within JO would have clean in politics. That GLP the penissless professor has arleady betrayed the academic community for his indulgencies. His has been criticised by DJ even before the former regime fell into pieces. At that time, his externl affairs were handely by that bagges boy Sajeen vaas reemember ? All in all, if India s controversal leaders back lanken former goons to return to power, this country will go in to piece in the years to come. If Mr Sirisena regardless of the status, delivered what he pledged before the elction – meaning punishing all the former men with all high punishiments, nothing would have come sofar. No matter he or anyone else would have been elected again, he should do what was promised in the manifesto. Very irresponsible act of former president right ? How come a man to have held Presidenshaft to fall that low level. We could forgive if Wimal Weerawanse or Most abusive Gonmanpila added the kind of remarks. Dalas Alahaperuma is standing behind him, but former president reiterates – that Alahaperuma is sick after having milk packet. Alaha peruma is laughing standing behind MAFIA BOSS. Where are we living Mr Rodrigo ? Not even once upon a time poor Africa produces the kind of leaders today, but we the srilankens with highest literacy rates in the region have produced VERY IRRESPONISLBE men as our leaders. Being unbiased, Ranil or Mr Sirisena or JVP leader Disanayaka would never fall to the level right ? MR has made him a joker by every means. No longer, he will regret to have shared SUBRA SWAMY that his brother would be a contender to next Presidency. Basil R may be searching thoughts to answer him now. But the man is out of the country right at the moment. What is now being played in Lanka is already in play in international arena. Countries with two party systems are going through the same fate as in Lanka. In the US the The GOP has been hijacked by pervert Trump and the same with SLFP. But people need to remember when the pact between RW and MS was made , at least RW tried to keep his side of bargain where as MS sole purpose was to be a hurdle in seeing that the govt will not succeed.Apparently he who ordered service personal not to cooperate with missing persons inquiry and helped the Admiral to leave country prior to court order.When you have such person on the top what do you expect from the rest.Then you had JO who were there as sleeper cells to sabotage any progress.Lanka is blessed with plenty of this kind. The slfp of Mahinda the largest ever single party in srilankan history which hold 46% of national vote base as a single party. Unp the party have only 23% vote base and the parties with unp alliance can add 8% as muslimcongress (4.2%), digambaram(2%), hela urumaya, rishard, fonseka can add(1.8%). Apart from this TNA can add 4.5% JVP can add 6% and slfp and floating votes 12%. In an case if slfp of Mahinda capture 5% of the floating votes they will make the next president of srilanka. This is the situation of votebase since 2005. In any case if the anti Mahinda votes divided in to small parties like JVP or unp the largest single party the slfp of Mahinda are the easy winners. The anti Mahinda parties has to stop their ego and they have to decide whether they are allowing slfp of Mahinda and their super business class to rule the srilanka for another 25 years. In future srilanka the small anti Mahinda parties like unp or JVP can not do any thing with the largest single business party slfp of Mahinda. JVP and unp has to understand this. Vishwamitra, did you mean ‘Victory for us Lankans’? We, the silent majority, chose to watch a game played by two home teams. Both teams are soaking wet in the culture of corruption/nepotism/impunity. The teams are after the pot-of-gold at the end of mono-coloured rainbow – one blue and the other green. One side says the bond issue is not an allegation but true and the ONLY scam. The other team is staring at the PCoI on SriLankan Airlines. Time to scuttle it? We, the silent majority, see that this came about because of the Y-coalition. We still believe in what the Y stands for. their failures to take the country forward either on agriculture or on industry..
that once stood like giants . All have lost that shine thanks to CHEAP POLITICS ! THANKS TO POWER AT ANY COST ! THANKS TO GREED AGAINST GENEROSITY ! SITUATION FOR REAL DEVELOPMENT !